Justice Danladi Umar of the Code of Conduct Tribunal has ordered that a bench warrant should be issued on the Senate President, Dr. Bukola Saraki, for failing to appear to answer charges bordering on assets declaration. The chairman of the tribunal, Danladi Umar, issued a bench warrant against Mr. Saraki, brushing aside a Federal High Court order seeking to stop Mr. Saraki?s arraignment. 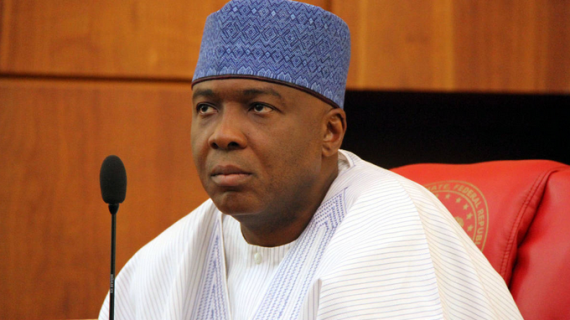 Mr. Saraki had on Thursday obtained a Federal High Court order directing that the case against him be halted. But Saraki?s lead counsel and former President of the Nigerian Bar Association, Mr. Joseph Daudu, has filed an appeal asking the court to set aside the ruling. He said, ?It is trite that when an accused files an application challenging the jurisdiction of a court/tribunal to adjudicate on the charge brought before it, the accused need not be present in court.? Daudu said the trial judge erred in law and ?acted without jurisdiction by countenancing and assuming jurisdiction over the criminal trial/prosecution of the accused/appellant at the Code of Conduct Tribunal for a charge, which is being challenged at the FHC, Abuja in suit No: FHC/ABJ/CS/775/2015 between Dr. Olubukola Abubakar Saraki vs Ministry of Justice and three others and in disobedience of the order of the FHC, Abuja Division dated September 17, 2015.? He sought an order setting aside the ruling of the lower tribunal dated September 18, 2015. The Federal Government had, on September 11, filed a 13-count charge against Saraki before the CCT and the case fixed for Friday (yesterday) for his arraignment. According to the suit filed at the CCT, allegations against Saraki include failure to declare property on Plot 2A, Glover Road, Ikoyi, Lagos; failure to declare property on No 1, Tagus Street, Maitama, Abuja (Plot 2482, Cadastral Zone A06, Abuja) and failure to declare property No 3, Tagus Street, Maitama, Abuja (Plot 2481, Cadastral Properties Limited). Others are claiming to own property on No 42, Gerard Road, Ikoyi and earning N110, 000,000 per annum at a time the property was under construction; failure to declare N375m GTB loan converted to 1.5m Pound Sterling and used to purchase property in London; operating a foreign bank account; transfer of $3.4m from GTB to foreign bank account during his tenure as governor and failure to declare leasehold interest in No. 42, Remi Fani-Kayode Street, Ikeja. Saraki was also alleged to have made anticipatory asset declaration of a house in Ikoyi in his asset declaration form he submitted to the CCB in 2003. But in an effort to stop his arraignment, Saraki approached the Federal High Court in Abuja with an ex-parte application seeking to restrain the Federal Government, Code of Conduct Bureau and CCT from arraigning him. In his ruling, Justice Ahmed Mohammed had summoned the chairman of CCB, Mr. Sam Saba, and a Deputy Director in the Federal Ministry of Justice, Muslim Hassan, to appear before it on Monday to show cause why Saraki?s application should not be granted. When the matter came up on Friday before the tribunal, the accused person was represented by Daudu and Mahmud Magaji. The prosecuting counsel (Hassan) argued that the accused was not in court despite the fact that he was served with the summons. He however prayed the tribunal to issue a bench warrant on Saraki for disobedience of court orders. Hassan said, ?I am surprised that the accused is not in court because he has been served with the summons. They exhibited it in their process, yet he is not here. In the circumstances, we humbly apply that a bench warrant be issued on the accused for disobedience of court orders. This court is constitutionally empowered; we apply that a bench warrant be issued, we can even give him two hours for us to be able to process the bench warrant.? But Magaji opposed the application, stating that the charge and the prosecution lack validity to come before the court on the ground that there is no incumbent Attorney-General of the Federation and Minister of Justice. He further argued that there was a pending ruling of the Federal High Court which had summoned chairmen of CCB, CCT and Hassan. Magaji said, ?My Lord, the application before you should be expunged including the appearance. That is, the appearance of the prosecutor should be expunged. The basis of our application is simply that the person making the application doesn?t have the locus standi to make the application. ?For him to be able to appear as a prosecutor in this case, there must be an incumbent AGF. This is in line with Section 24 (2) of the CCT Act which provides that the AGF should authorise prosecution.? In order to assist in the interpretation of his argument, he cited paragraph 18 of the Third Scheduled of the CCT Act which implies the prosecutor, meaning AGF or anybody authorised by him. ?Where there is no substantive AGF, there is no authorisation,? he said. Magaji cited Attorney-General of Kaduna State vs Hassan, a Supreme Court verdict in 1985 contained in the Nigerian Weekly Law Report, pg. 486. He said, ?The Supreme Court said the power of Nolle Prosequi should only be executed by the AGF. It means that his application is a nullity because you cannot put something on nothing. ?The application by the counsel purportedly representing the AGF is grossly misconceived in view of the fact that my learned friend is aware of a pending suit in the FHC. ?With respect to Section 122 of the Evidence Act in 2011, this tribunal is empowered to take judicial notice of the ruling we are referring to in the circumstance.? The tribunal later stood down the matter and adjourned for about three hours. Delivering his ruling, Justice Umar held that the tribunal took notice of the fact that there was no AGF at the moment and that the absence of the AGF did not stop the filing of a criminal charge. He said that in the absence of the AGF, the Solicitor-General could institute such a charge. The tribunal knocked off the argument of the accused. On the issue of a pending ruling, the tribunal held that the FHC has the same jurisdiction with it, and hence, it is not binding by its ruling. Justice Umar held that the tribunal would go ahead with the trial. The judge also said that it was clear that the accused person had been served with the summons, as such was shown by the proof of service. He said, ?This tribunal is established under Section 15(1) of the 5th Schedule of the 1999 Constitution as a special vehicle vested with the powers to promote probity and accountability in the public service. ?The accused is expected to respect the summon of this court and respect the constitution which he has sworn to protect as a senior citizen of this country. ?I hereby order a bench warrant to be issued on the defendant. The IGP and other relevant security agencies are to produce him in court on the next adjourned date. No court of co-ordinate jurisdiction can halt the proceedings of this tribunal. This tribunal called on the Senate President to come and stand his trial.? The tribunal later adjourned till Monday for arraignment. The Force Public Relations Officer, Olabisi Kolawole, said the police had not been served with the order for the senate president?s arrest. ?The Inspector-General of Police has not been served with the order. When we get the order, we will know the next step to take,? Kolawole said. But Saraki has said the order for his arrest by the CCT is nothing but a desperate bid by his opponents to settle political scores. Saraki was reacting to Friday?s order for his arrest by the CCB. He said while he is prepared to submit himself to the judicial process, he would not hesitate to go through the same process to protect himself when there are infringements on his rights. The President of the Senate said this in his first official reaction to the order. His reaction was contained in a statement signed by his Special Adviser (Media), Yusuf Olaniyonu, in Abuja, on Friday. In a veiled reference to his unnamed political rivals, the Saraki team said, ?We want to emphasise the fact that this is not part of any war against corruption but using state institutions to fight political opponents and seeking to achieve through the back door what some people cannot get through democratic process.? The statement partly read, ?We need to caution here that in a desperate bid to settle political scores and nail imaginary enemies, we should not destroy our democratic institutions and heat the polity for selfish reasons. Let us all learn from history.? According to the statement, it was a surprise that despite the application by the lead counsel to the Senate President undertaking to produce Saraki on Monday, and Saraki?s standing in the nation, the Tribunal insisted on issuing a warrant of arrest as if its intention is simply to embarrass Saraki. The statement also said the Saraki team is not unmindful of the fact that the tribunal ?is acting under political influence and external pressure? which it said is dangerous to our democracy. It equally said the conduct of the tribunal on Friday left nobody in doubt that it cannot do justice on the matter before it. ?It is also clear that today?s decision is an abuse of the rule of law which portends danger to our judicial system. The tribunal has equally set a bad precedent in the way and manner it conducted itself during the proceedings,? it added. The statement which described the Senate President as a law abiding citizen, said his absence from the tribunal was based on the legal advice he received from his counsel that the tribunal would respect the decision of the Federal High Court which is obviously a superior court of records.